French carmaker PEUGEOT was in quest of the perfect concept car: and not just perfect to look at. The PEUGEOT FRACTAL would be a fully-electric urban coupé created to explore new design and manufacturing processes, all wrapped up in sleek aesthetics — but above all, it had to sound perfect. PEUGEOT already had a state-of-the-art sound system in mind, characterized by the spatialization of sound to enhance the driving experience. To maximize the effect of the dynamic sound system, any noise interference had to be minimized. The solution? 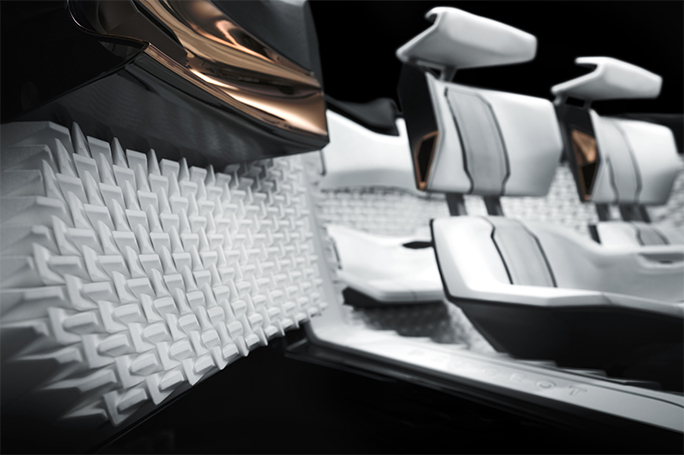 An anechoic sound chamber for the car’s interior, which would cancel out any external noise and absorb internal echoes. You’ve already seen these in recording studios, where internal acoustics are crucial. But how do you recreate such an effect for a concept car? To achieve an anechoic chamber, you would need to cover the interior trim with complex shapes resulting in an irregular surface. Precisely how complex the shapes can be, if you’re using a conventional manufacturing method, would be determined by what is possible in that manufacturing method. But geometric complexity is not a deterrent at all in 3D Printing, so the designers had already determined that 3D Printing was the way to go for this project. In fact, they had a specific 3D printing technology in mind: laser sintering. Making that choice from the outset left the designers free to come up with any shapes required for optimal acoustics, without having to worry about complexity-related costs. Besides, as a concept car, this was very likely to be a one-time production for which investing in a mold would have been wasteful. ​But before the design files could go to the printers, some of them had to be sliced into manageable file sizes. Large file sizes — which often can’t be avoided with complex designs featuring textures — are notoriously likely to give 3D printers a hard time. With Materialise’s Build Processor software , the slice-based operations technology of the Materialise Build Processor can take complex, unwieldy files and save design metadata in slices, keeping the STL file a manageable size. In our Factory for 3D Printing, with Materialise Streamics monitoring the entire printing workflow, the parts were laser-sintered in polyamide. The material is white to begin with, which was what PEUGEOT was looking for. But to enhance the look-and-feel of the parts, the production team gave them a finish with a flocking process. The flocked coating makes the parts more wear-resistant and also improves the tactile quality, with a soft, velvet-like feel. We weren’t the only ones excited about this project: French TV program M6 Turbo came over to our production room to watch the printing in action. Watch the show here.